Back yard birding ranks as many birders favorite past time. Set up a bird feeder and wait for the birds to arrive. Most mornings birding becomes a full time obsession as a glance or two out the window is never sufficient time to enjoy the constant parade. Generally two feeder birds seasons run through the year. Year round birders welcome year round perching birds such as the chickadees, jays and sparrows on a daily basis. When the spring and fall migration seasons are ready, they plan for the extra company. This https://greennature.com/wp-content/uploads provides pictures and reviews of representative species from bird families that welcome the placement of bird feeders in back yards across the country. One dozen of the small and active Paridae species, the Chickadees and Titmice, take up residence in North American fields, forests and residential areas. The familiar chick-a-dee-dee-dee song of the seven native (Poecile) species greets the ears of most visitors within their range. Most Chickadees reside year-round in their territory, although some migrate short distances during winter in search of a more consistent food source. Their diet varies depending on season and usually consists of insects, fruit and seeds. During winter they naturally visit backyard bird feeders. 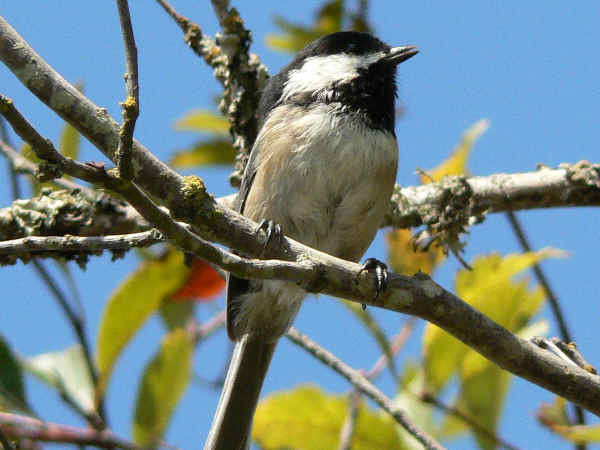 The top picture shows the Chestnut-backed Chickadee, a Pacific Northwest resident. The National Audubon Society lists the Boreal Chickadee, a species at home in Alaskan and Canadian boreal forests, as one of the top five common North American birds experiencing severe population decline. the Black-capped Chickadee, ranges from the forests and residential areas of Alaska to Maine. Officially designated the state bird of Maine and Massachusetts, they can be easily identified by the presence of black feather patches on the head and throat. Five titmouse species, genus Baeolophus, accompany the chickadees in most regions. The Tufted Titmouse (Baeolophus bicolor) for example, the dominant Baeolophus in the Southeast, often inhabits the same territory as the Carolina Chickadee (Poecile carolinensis), the region’s dominant Poecile species. Southeast residents who commonly watch both species around the backyard bird feeder might notice that more often than not, the titmice rank above the chickadees in the pecking order and usually eat at the feeder first. 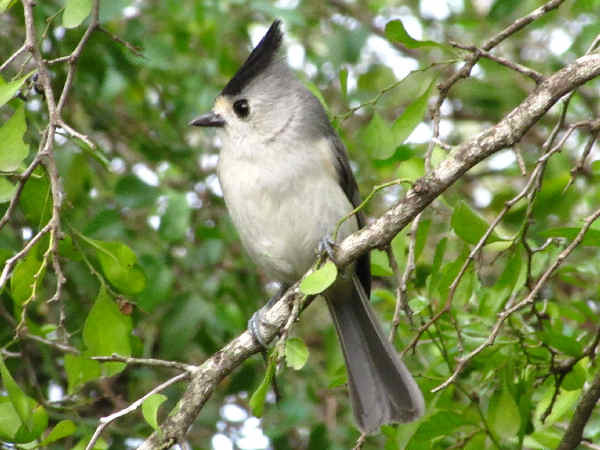 Picture three shows the Black-crested Titmouse (Baeolophus atricristatus), the dominant species of Texas and northern Mexico. Often considered among the most intelligent of the bird families, the twenty North American Corvidae species include familiar birds such as jays, crows, ravens and magpies. In addition to the intelligence trait, most corvids also get described as medium sized birds that adapt well to human environment. Many corvids also reside year round in a territory, dominating the back yard feeders during winter months in colder climates. Ten multicolor jay species compete for North American territory. Blue Jays (Cyanocitta cristata), the dominant jay east of the Rocky Mountains, readily take to back yard feeders offering corn, sunflower seeds and peanuts. One of their western counter parts, the Western Scrub-Jay (Aphelocoma californica) shares a similar pattern of behavior and diet. 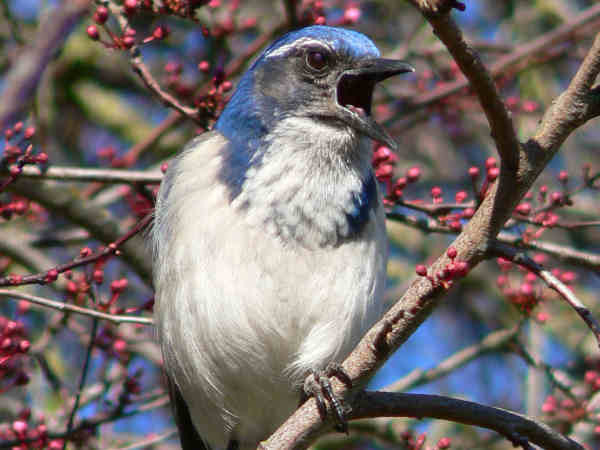 The video of the Western Scrub Jay, one of four native Aphelocoma species, shows it consuming a bird egg, part of most jay’s eclectic diets. Despite their coast to coast presence in residential areas, no state has ever designated any Corvidae species as the state bird. The tables turn in the Canadian portion of North America. Three of Canada’s eleven provinces designated a Corvidae species as the official Provincial bird. British Columbia honors the Steller’s jay (Cyanocitta stelleri), Prince Edward Island (Blue Jay) and the Yukon (Raven), round out the Canadian Corvidae celebration. The family Emberizidae encompasses a variety of species commonly seen around the home and garden. Along with the more widely known sparrow species, Emerizidae includes juncos, towhees, longspurs and Emberizid buntings. The American Birding Association’s Version 7.3 checklist lists fifty-five Emberizid species, organized into nineteen genera. Multiple subspecies also receive formal recognition Emberizid diversity reaches its peak in two genera, the seven Spizella species (sparrows) and the nine Emberiza species (buntings). 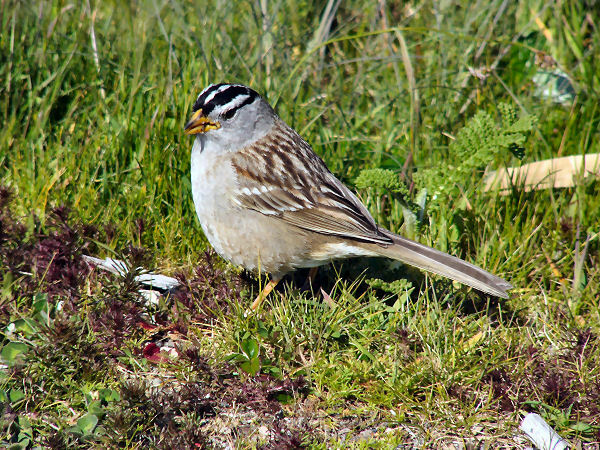 Icterids, a common name for members of the family Icteridae, includes familiar species such as meadowlarks, blackbirds and orioles. Neotropical migrants, they winter in the warmer latitudes around the equator and migrate north for breeding season. Approximately one fifth or twenty of the one hundred icterid species inhabit North American territory during part of the year. Red-winged blackbirds (pictured), the most common member of the Icterid family, also rank as one of the most common birds in the United States. 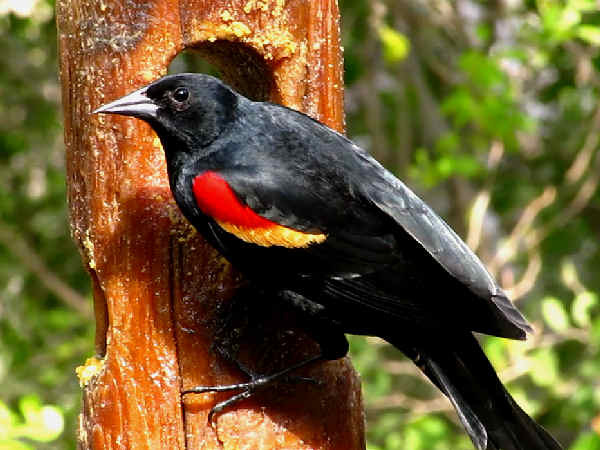 Males are easily identified by their black feathers, highlighted by a splash of red in the wings. 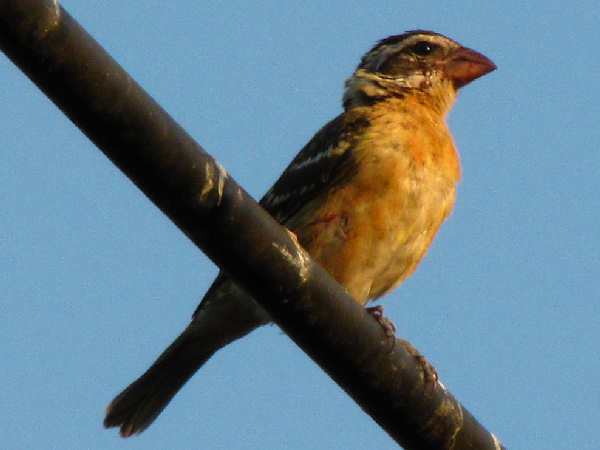 Females have brown feathers and streaks on the breast. They often move in large flocks and can easily crowd out a feeder. The song of the Western Meadowlark (Sturnella neglecta) greets residents of the central and western grasslands each spring. Their colorful appearance and cheerful songs inspired residents of six states, Kansas, Montana, Nebraska, North Dakota, Oregon and Wyoming, to designate it as the official state bird. Cowbirds receive most attention for being brood parasites. Pairs move about their range during breeding season with females laying eggs in host nests. Most cowbirds migrate short to medium distances between winter resting and summer breeding grounds. Brightly colored feathers and cheerful songs make the ten native Orioles species (Icterus) popular spring and summer residents across North America. 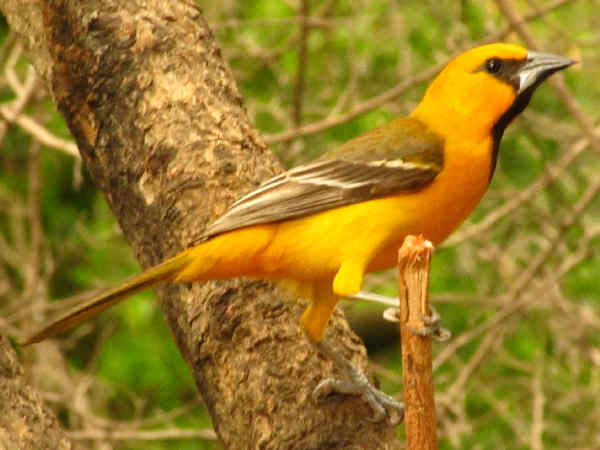 A neotropical migrant, the Baltimore Oriole (Icterus galbulas) extends its breeding range over much of Eastern North America. Maryland designated it the state bird in 1947, and interestingly enough, a changing climate suggests that its southern most breeding range including Maryland, could potentially warm to a point of being unable to host breeding populations. Orioles dietary habits change according to season. Their diet consists mostly of insects. However, they also eat fruit and nectar. During spring migration, enticing them to feeders can be as easy as slicing citrus fruit and attaching it to a low hanging tree branch. Twenty three finch species (Fringillidae family), sorted into ten genera, including Redpols, Grosbeaks and Siskins inhabit North American fields, forests and residential areas. Popular since the days of Darwin, the colorful feathers and mild tenement of native species make them popular visitors to back yard feeders. Colorful feathers also once made two native finch, the American Goldfinch and the House Finch, popular in the American pet trade market. Today birders make due by inviting finch species to their back yards. 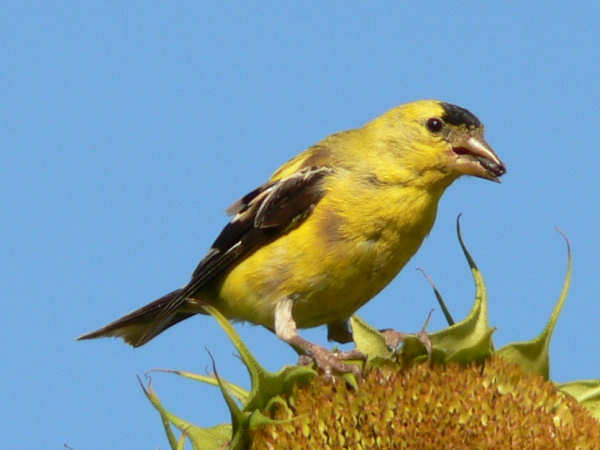 Providing both thistle and larger seeds such as sunflower seeds in separate feeders helps attract a wider array of local finch species. The term goldfinch often refers specifically to the five Spinus species, including the popular American Goldfinch (Spinus tristis) pictured. Iowa (1933 Eastern Goldfinch), New Jersey (1935 Eastern Goldfinch), and Washington (1951 after a twenty three year competition with the meadowlark), designate it as their state bird.